Mexico Living’s Baja California magazine needs your help to determine the cover of our January 2011 - BEST OF BAJA EDITION. 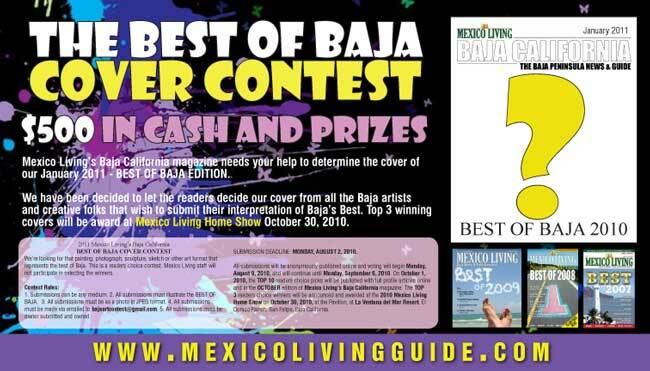 We have been decided to let the readers choose our cover from all the Baja artists and creative folks that wish to submit their interpretation of Baja’s Best. Top 3 winning covers will be award at Mexico Living Home Show October 30, 2010. We’re looking for that painting, photograph, sculpture, sketch or other art format that represents the best of Baja. This is a readers choice contest. Mexico Living staff will not participate in selecting the winners. 1. Submissions can be any medium. 2. All submissions must illustrate the BEST OF BAJA. 3. All submissions must be as a photo in JPEG format. 4. All submissions must be made via emailed to bajaartcontest@gmail.com. 5. All submissions must be owner submitted and owned. SUBMISSION DEADLINE: MONDAY, AUGUST 2, 2010. All submissions will be anonymously published online and voting will begin Monday, August 9, 2010, and will continue until Monday, September 6, 2010. On October 1, 2010, the TOP 10 readers choice picks will be published with full profile articles online and in the OCTOBER edition of Mexico Living’s Baja California magazine. 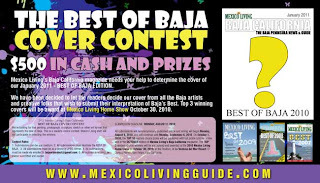 The TOP 3 readers choice winners will be announced and awarded at the 2010 Mexico Living Home Show on October 30, 2010, at the Pavilion, at La Ventana del Mar Resort. El Dorado Ranch, San Felipe, Baja California.